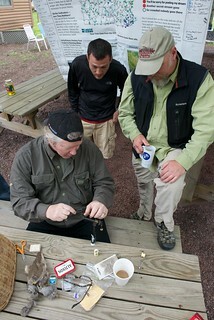 Paflyfish is a popular spot for fly fishing anglers in the region for a lot of good reasons. There are all sorts of great conversations and information shared in the forums on a host of different topics. We are very fortunate to have so many folks not only provide information online in the forums, but help out beginners at clinics and instructional jamborees. Also there are some darn smart anglers on the site coming from all walks of life. I am hoping to expand on that information this spring with a new and updated series of content on the site that is targeted for beginners getting started with fly fishing. From my own experience, it took me many years to really grasp a strong understanding of the sport, let alone having any confidence that I knew what I was doing on a stream. I still question myself after 30 years, so not much has changed. After my last few years, revisiting the fundamentals of the sport would be a good lesson for me as well. I have found myself in a rut with some old habits and anxious to hone my skills again. Specifically, I will be adding a weekly blog post to the site that will be aimed at beginners for several months. 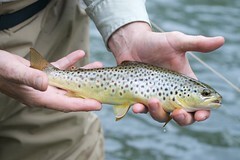 I will cover many of the fundamentals of the sport including topics on trout, streams, hatches, flies, gear and more. As we move into April and May we will cover specific techniques and strategy based on the time of year. These blog posts will be great for anyone just trying to get their head around the sport. There are plenty of great books and Internet resources for anglers to explore as well. The posts are intended to be an introduction to a topic. I will be making sure to include that information as well so folks dig a little deeper on their own. Part of the fun of the sport is the exploration. I plan on updating some of the existing static content on the site as well. It has been a while since the Hatch Charts and Where to Fly Fish sections have been improved. I look forward to enhancing those sections and adding some new ones including a Fly Fishing Terminology Page. Subsequent posts in the Fly Fishing Getting Started section will be organized and likely made into their own menu on the site. Those beginners that want to follow along can join in the conversation at the Beginners Forum. A great spot to ask any questions and get a lot of good answers. No hassles or trolls guaranteed! I would then suggest you participate and share your success in the Stream Reports forum. This forum is as much about sharing your fly fishing success as it is sharing stream conditions around the region. We all benefit from knowing water conditions and the timing of hatches. Good chance to get some more help about what you experienced on the stream too. Finally Beginners might want to stay up with the Events Forum. Plenty of activities and events Paflyfish and from from other organizations posted here for you to get involved with as well.